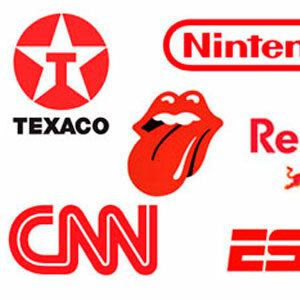 Red is the most powerful colour and best brand identity designers know it. Red is the colour of passion, love, risk, strength and energy. It’s the most attractive colour, therefore it’s always the first choice for professional branding designers when the company is the first of its market. Red is the colour of the leader. If you create a new niche market, red colour is your choice. Not only is red the perfect colour to attract the attention of your clients, but also it encourages them to buy. It estimulates and excitates senses, therefore it makes people more receptive. Nevertheless, you should know there’s always an alert nuance in red branding designs that should be studied carefuly in some cases. If your brand or product could be associated with negative features such as death, pain, fear, etc. you should avoid using this colours in your company branding strategy. It’s no wonder that the first in the niche market choose red for its brand identity design. Cocacola is the leader in beberage market so they chose it. Usually it happens that the second one chose blue, because he needs to differenciate his brand. Pepsi arrived the second, therefore they chose blue. However, the golden rule that almost always occurs is that leaders use red colours because they were the first arriving the party. Finally, I must warn you that although red colour is a winner choice for best brand identity desiners, it’s not always the correct choice. Not very often do new companies enter a new niche market, so it’s not a good idea to design your new brand identity using red unless you are the leather or you want to be linked to the leader. But in my humble opinion this last strategy is a looser one. I recommend to create new, original and unique brand identity designs to build new brands, to buid their own visual universe. Don’t copy the leader. Who moves black pieces copying the white player is dead in less than four movements.